For most kids, Easter usually means school holidays, trips to the Royal Easter Show, swapping chocolate eggs with friends, and eating countless hot cross buns. I was certainly one of those kids, but these days I like to bake my own hot cross buns. So far, I haven’t managed to do that this year. Not from lack of wanting to, mind you. I’ve just been a little busy with this and that. So a few days ago while I was making some chocolate cookie dough, it occured to me that I could rectify my hot cross bun-less situation. The dough ended up being made into these caramel and chestnut cookies, but I also saved some dough scraps which I then added some raisins to, rolled out again and cut as rounds. Once baked, I piped crosses over the top of each cookie, using royal icing, and sandwiched them between vanilla ice-cream flavoured with lots of nutmeg, allspice and cinnamon (since I like my hot cross buns spicy). I’m quoting the recipe for the basic chocolate cookie dough below, because it’s a handy one to have. As Fran Bigelow says in her cookbook, it is a very versatile dough which you can use not just for cookies, but also as a tart shell. I can imagine them being used to sandwich some salty caramel ganache, or mint flavoured buttercream or even fashioned into homemade Oreos somehow. In the meantime, I’m happy to have some Easter fare to enjoy. 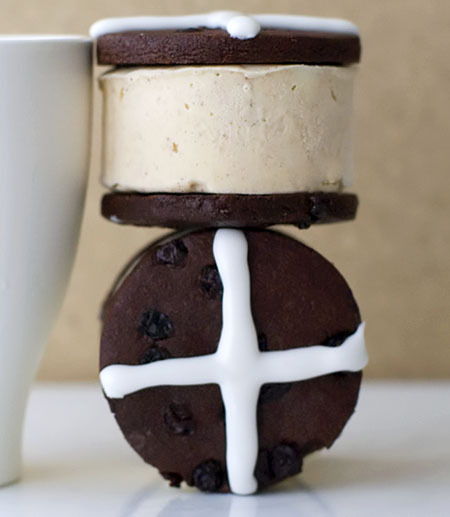 Hot-Cross-Bun-Ice-Cream-Cookie-Sandwiches? Takes ten minutes to pronounce, I know, but only two seconds to scoff down. In a mixer with a paddle attachment, cream the butter and sugar on medium-high speed until fluffy, about 4 minutes. Add the cocoa powder and mix on low speed until well combined. Scrape down the sides of the mixing bowl. Add the egg and vanilla and blend thoroughly, scraping down the sides of the mixing bowl. Add the flour. Mix on low speed until the dough begins to hold together. Wrap the dough in plastic wrap and chill until firm, about 4 hours or overnight. To bake, position an oven rack in the middle of the oven and preheat the oven to 162’C. Line a cookie sheet or two with parchment paper of Silpats. Working quickly, on a lightly floured surface roll half the dough into a 12 x 12 inch square, about 1/8 inch thick. Using a 3 1/4 inch round cookie cutter, cut out about 12 cookies. With a metal spatula, transfer to a lined cookie sheet. Pierce each cookie with the tines of a fork several times. Bake for 8 to 10 minutes, until slightly dull on top. [Note : Mine were a little thicker and took slightly longer to bake] Transfer to racks to cool. They will crisp as they cool. Repeat with the remaining dough, gathering the scraps together and gently kneading into a second batch. Store in an airtight container as long as 1 week. Absolutely gorgeous. How did you get them to look so perfect? These are so cute Y, I love them! The icecream sounds great with all the spices. cheers and wide grins for the very versatile recipe. These are very pretty. I love the design and photography! Goodness!!! There are just sometimes when I want to reach through the screen, grab one and run away – this is definitely one of those times! Those look gorgeously YUM!! Beautiful photographs! swapping easter eggs with friends?!! goodlord! what kind of slap-happy childhood do you have? down in our neck of the woods you guarded your carefully horded eggs like a rabbied dog. where the law was, you snooze, you lose.harsh but fair. You must’ve read my mind! I was planning on making hot cross buns cookies for easter!! Btw, that took 5 seconds less to pronounce. I love that you added raisins to your chocolate wafers, and yes I used royal icing too for the crosses. The recipe actually called for marzipan, but there’s no way I’m spending money to get a 1kg block when I don’t like the stuff anyway. And I put the exact same spices in my cookies!! I’ll trade you!! these look far more appetizing than the original hot cross bun… i am also a major fan of the addition of raisins ~ one of my fave, most decadent brownie recipes uses cognac-soaked-then-mashed raisins ~ so nom. you have been on a roll baking away Y! I love these! Y – fantastic. A great, very creative idea. When I whip up my batch of hot cross buns this weekend I’ll feel all boring and plain in comparison! If I show this post to my partner, he’ll have me whip this up instead. He’s a *massive* fan of the ice cream sandwich. P.S. You have been busy! Holy cow these are pretty…Oh, and I think your blog posts make up for being ‘too loud’ or forgetting the figs :D! Just bake your neighbor up one of these beautiful treats and they’ll be happy! Thanks everyone, for the comments! Caitlin : Breakfast appropriate? You crack me up! Lorraine : Ah but you see, I’m a huge fan of eating ice-cream in cold weather because it doesn’t melt as quickly. theprojectivist : Really? Must’ve just been my school then. I also swapped lollies with my cousins. I’d trade fried eggs for black cats. A friend of mine cleverly (or so she thought) hid her chocolate egg stash in a drawer only to discover them all moldy and gross, some time later. Christy : Ooh fancy that! Did you make it for personal consumption? Yes, would happily trade with you .. but not with anything involving ice-cream. kayce : That brownie sounds great! I love boozy raisins. Those look and sound delicious, especially with the spicy element. Yum! 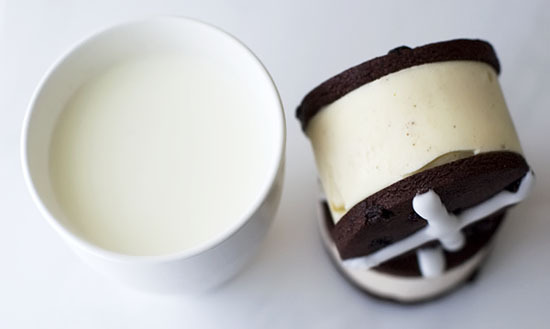 Those ice cream sandwich cookies look really good! what an inspirational way to indulge in “hot-cross buns”…personally I’m not so fond of the traditional version and would rather have your ice cream sandwiches! So, so pretty – have a lovely Easter! 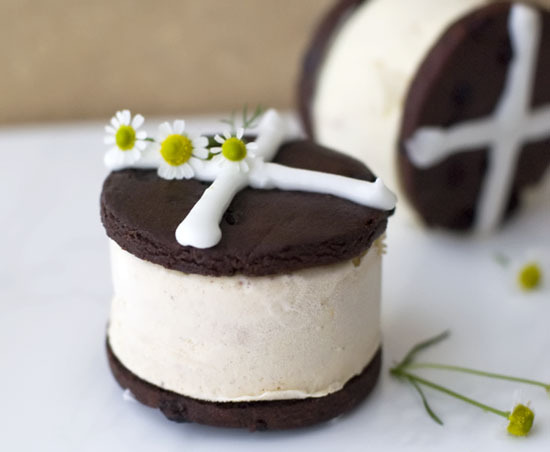 NIce… I thought your took actually hot cross buns and filled them with ice cream, but these sound much better. wow, these sound so much more appetizing than boring old hot cross buns! Ha, this is so clever! Definitely a take on hot cross buns I would like much more than the original. Wow,…..This is perfection!! Delicious!!! You are one creative woman!! I’ve been browsing ice cream recipes and stumbled across your post. These little sandwiches look wonderful! !